SeeClickFix works because its users work too. 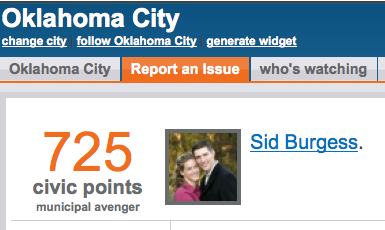 Recently, a number of people including city officials, bloggers, good citizens, and community leaders have signed up to do their part as SideClicks. So what does it mean to be a SideClick? Well if you’re thinking that we want people in cities across America to scream from the rooftops, “SeeClickFix Rules and you should use it,” you’re right, but that’s not all our SideClicks are doing. 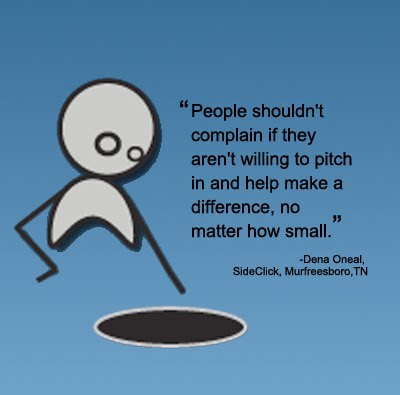 Dena Oneal from Murfreesboro, TN learned about SeeClickFix from our recent write-up on CNN.com. She reached out and inquired about becoming a SideClick. A special thanks to Ms. Oneal for her willingness to become a SideClick. To get started visit our Get Involved page. … and of course, scream about SeeClickFix from the rooftops… duh! Craig Newmark, one of the Godfathers of social networking technologies (also known as the founder of Craigslist.com) used SeeClickFix to report an issue in his hometown of San Francisco. Using the SeeClickFix mobile web application he reported his issue regarding excessive heat on a public train, and within a week received notification from the city of San Francisco that they were working on the problem. 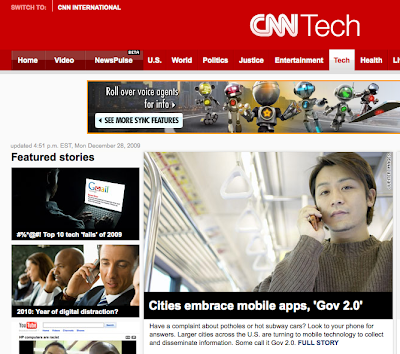 CNN.com reported about Newmark using the SeeClickFix tool and noted that the technology, GOV 2.0, is a huge part of a new era where public service is no longer a laundry list of to-dos but an interactive world where citizens have more control over what gets done because they are a part of the solution. 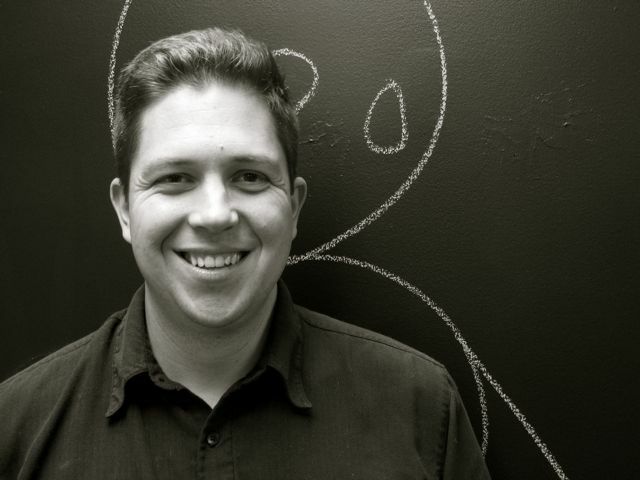 As we bid farewell to a decade of all types of new technological advances, it’s nice to know that SeeClickFix is coming out as a leader of a better tomorrow. Read the whole CNN.com story here. 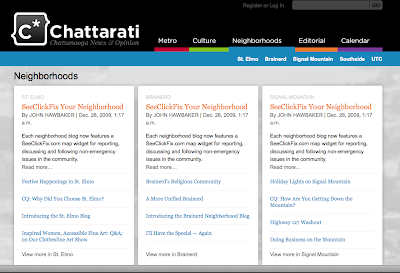 A Chattanooga, TN, hyperlocal news website, chattarati.com, has recently added SeeClickFix to their neighborhood blogs. Editor, John Hawbaker sees the SeeClickFix tool as an extension of the goal of his websites: to engage Chattanooga citizens with the community around them. In St. Elmo, a neighborhood around Chattanooga, Hawbaker reported on chattarati.com about local people creating homemade signs encouraging drivers to slow down. There’s no doubt that SeeClickFix will become a vital tool for the already engaged citizens of Chattanooga while also offering additional support to help connect citizens to government. STAND, a community visioning effort led by residents across the Chattanooga region helped to bring awareness of SeeClickFix to the area. Their active role in introducing us to the Chattanooga community has led to sites like chattarati.com embracing SeeClickFix and overall civic engagement with the tool. And lastly, Liz Henley, Chattanooga 311 Call Center Coordinator, has been working tirelessly to address the concerns of citizens in her city. Ms. Henley swiftly managed a blighted property concern in Chattanooga. Our thanks to Ms. Henley and the citizen reporter and a huge thanks to STAND and chattarati.com for spreading the word about how SeeClickFix is a great tool for the big picture of civic engagement. As we brace for yet another bout with Mother Nature, we wanted to take a moment to thank the city for doing a great job of cleaning up our streets after Saturday night’s deluge of snow. Areas, that residents felt weren’t attended to, were quickly fixed through notification by reporters on SeeClickFix and the diligence of the Livable Cities Initiative. Check out the progress of this issue. 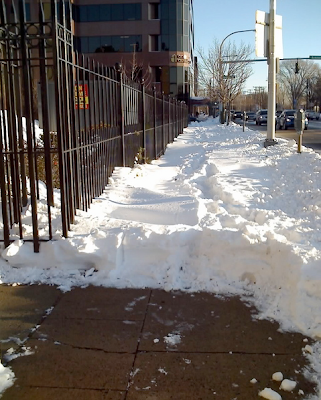 In the future, we’d like to remind reporters that SeeClickFix is also a good place to remind your neighbors of sidewalks that need shoveling in your living area. It’s also a way for neighbors to help neighbors — especially those that may not be able to shovel snow themselves. Cleaning up a city after a big snowstorm is both the responsibility of our government and the good neighborly thing for everyone to do. To Thank You for all you've done with SCF also to wish you and yours the HAPPIEST and MERRIEST of Holidays. This reminds me to thank everyone who has used, contributed to and advised us over the last year. We are truly grateful for your help and use of the tool and the timing and cultural climate that has allowed SeeClickFix to flourish over the last year. Last week, SeeClickFix had the pleasure of partnering with media outlet Savannahnow.com , in Savannah, Georgia. Before Savannahnow took the SeeClickFix widget live, their city map was relatively dark with just a handful of issues being reported by citizens. In a matter of days, the map began to grow and issues like potholes and spilled commercial waste began populating the area. Then, a few days ago, eight concerned citizens (and counting) stepped up to say they were unhappy about a dangerous bike path. Soon, following the concern, watch areas were created around this bike path for City Council as the city had not yet responded. But, perhaps the best news from our new partner came in a matter of two hours of an issue being opened. Concerned about a broken water line cover that was causing cars to get stuck on the road, a concerned citizen reported to SeeClickFix as first-time user and waited to see if and when something would be done. Two hours later the poster typed, "OMG - it actually works!! in less than 2 hours there is a city worker checking out the problem!! Thank you so much for this tool! KUDOS!" Issue Closed! 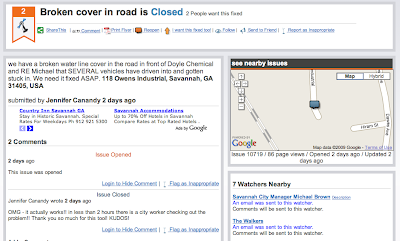 A KUDOS back at ya Savannah Citizen without your report, SeeClickFix would not work the way it does. This seems to be the start of more good things to come for Savannah. 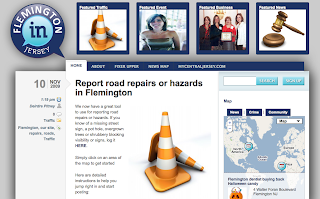 There is a tremendous role for SeeClickFix at every local newspaper. At the Journal Inquirer we're scratching the surface by using local SeeClickFix reports as story topics and also as a way to develop new sources. I've become something like a consumer advocacy columnist, but it's more like a "homeowner" or "resident" or even a "taxpayer" advocacy columnist. We found that there is real interest in this stuff. I've gotten more responses on my first 8 or 9 SeeClickFix columns than on anything else I've ever done in journalism. It's been fun getting back out into the field. We haven't completely carried this through to its conclusion yet as a circulation booster or revenue generator. But I'm working on those final steps with our ad people and circulation department. Why is this valuable? Does it fit with our mission? I won't belabor the overarching truth of the print news industry's situation ... but my assessment of the JI's problems is simple: we're losing core readers with every obit we publish, and we're not adding new readers. We're nowhere near as interactive as we can be. We're losing print advertisers and we're not gaining online advertisers. We're an old product in a new world. Essentially, for a long time we had been putting our print product up on the Web, as is. It's not very interesting to a Web user. On coverage choices, we're stuck in a local politics rut. Most people don't care about local politics at all, even during election season, but it remains the focus of our coverage. We cover the budget process to death. We tailor our coverage to "locals" but we're tailoring it only to locals who care about, or who are involved in, local gov't. That's no longer good enough. We won't abandon that coverage, but SeeClickFix is a way to insert the JI into neighborhood conversations again and to make us interactive. When people bump into each other as they walk their dogs, what do they talk about? Potholes, graffiti, speeders, eyesore properties, etc. I want those people to say, "Hey, I reported that graffiti on SeeClickFix.com and the guy from the JI wrote a story about it, and then the town came out and cleaned it up." So it's true that on some level this is marketing as well as journalism. We're basically trying everything now, within reason, to see what will get people to subscribe. The goal is to improve both our print and online product as inexpensively as possible, and to make them work together rather than undercut each other. I'd heard about SeeClickFix early on when the New Haven Independent started using it. I kept an eye on it and it really does empower readers to clean up their neighborhoods. Last year I built a JI-Land map on the SeeClickFix site. And then I let it sit for a while. There was maybe a single report in our map when I built it. Then the Hartford Courant published a story about SeeClickFix's early success as a startup - and basically notified everyone in our region about this new online tool. The day the Courant's story ran, I started receiving emails from new SeeClickFix users who were posting issues within our JI-Land map. But I began communicating with the people reporting stuff in JI-Land and we eventually added the widget to our home page. We got a SeeClickFixPro account (for $38/month) to better brand everyone with a red JI on my messages. I keep handy our annual Discovery section (with phone numbers for all of our town officials), and started directing people to the departments and staff who could solve their problems, making it as easy as possible for them. The SeeClickFix widget allows people to report stuff right there on the JI's Web site, and we get that traffic. They can click all the way through to the SeeClickFix site, but it's a good widget that does help keep traffic on our site and can be sized pretty much however you need it. Pretty soon I was shooting photos and writing columns for print about the issues people were reporting. I posted links to my copy on SeeClickFix to prompt people to subscribe, even if only for 24 hours of access through our paywall, to read what I wrote about their problem. I don't know if that worked, but it was worth trying. One of our towns requested a meeting with us because they felt that the JI was making it seem like we were responding on their behalf. They wanted us to direct people to their online Citizen Request System, which is great but offers no public comment. We showed the town how to build their own map and now they get notifications and post their own links to their Web site on the issues reported there. We're working with them, rather than against, and believe me they seem to be quickly responding to every SeeClickFix complaint on which I post a comment. Truth is, a lot of the time town officials simply don't know there's a new pothole or whatever. They just need to be informed and the JI is playing a role in that notification. When I comment on an issue, the town knows we're watching and they know they have to respond or face negative publicity. When I do write for print, we've been starting the columns on Page 1 and that seems to help. I wrote about an algae-covered pond in a public park in Windsor, and as it turned out the town was about to dredge it anyway. We got the town of Vernon to start the clean-up process on a foreclosed house and yard, and the town got the bank that owned the house to finish the job (as the bank is supposed to do anyway). And then we did 3 or 4 pieces on speeding issues throughout our area. We published a picture of a woman's cat, which had been killed, and I was flooded with emails and phone calls at my desk. 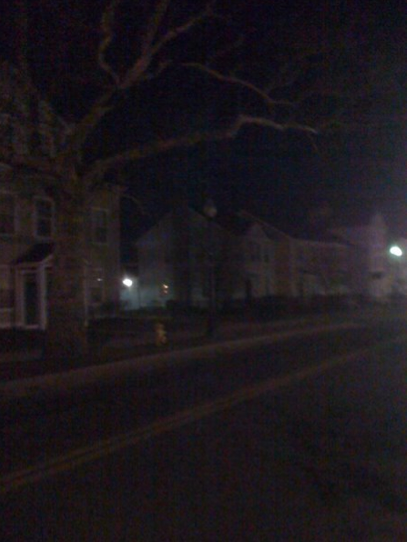 We were then contacted by a guy with MS who is in a scooter and has to wear an orange vest and lights to get across the street safely in Windsor Locks. He even added 8-foot orange flags to his scooter to ensure he isn't struck in the crosswalk or in a parking lot. Really compelling stuff. In South Windsor, people were fed up waiting for the completion of a bridge and we had quite a dialogue about that construction process. People thought the project was abandoned when the workers were off-site, fabricating large pieces. In another town, an historic mill building is a terrible, empty eyesore and there's been plenty of dialogue on it. The mayor appears to have been sitting on information about the ongoing process of obtaining multiple permits for the building's redevelopment -- controlling information. I'm told that he even threatened a council member with an ethics complaint for bringing up questions about the mill building during a council meeting. He really didn't want the info out there, or so it seemed. But local residents started the dialogue about the mill online, and I responded with a few thoughts and links to background info from the JI's archives. Within 24 hours the mayor responded to me by email and both the developer and town administrator posted public responses about the status of the redevelopment. Good stuff. It's important to note that this is a mayor who has basically stopped communicating with the reporter we'd assigned to the town. Frankly, I think every reporter who covers a community should be using SeeClickFix, but so far it's just me and one other reporter at the JI, and I'm on the layout desk so it's tough to find the time to do this. You may want to approach it as a team project. Now the trick is - how do we monetize it? Our circulation director thinks our SeeClickFix coverage is a strong, new selling point for our newspaper. We're talking about adding it to our sales dialogue and maybe even offering a discount to new subscribers who find us through SeeClickFix by posting an issue - or something along those lines. 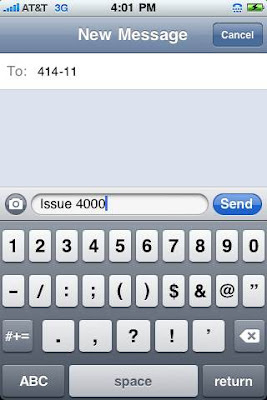 If we add a hard code in our circulation database we can track the people who subscribe because of SeeClickFix. Further, our circulation managers "sample" neighborhoods all the time - delivering papers for free for three weeks or a month to nonsubscribers. We're looking at ways to coordinate SeeClickFix coverage in those sampling areas to increase our yield when those same managers go door-to-door to try to pick up new subscribers. It'll be pretty powerful to say something like, "we're already looking out for your neighborhood - here's a story." 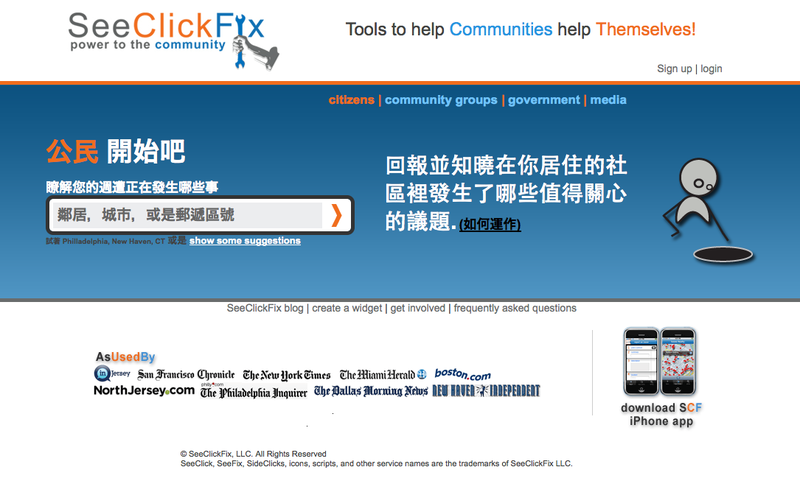 On sponsors ... we are adding a spot for an ad in the SeeClickFix tab on our home page. We're also planning an "eyesore" project, where I'll write about the worst eyesores in each of our 17 towns. Aside from print, we'll try to produce a short video story about each eyesore as well. Our advertising VP thinks he can sell that kind of package - a print ad for each story, a 5-second pre-roll commercial for each video, and maybe an overall sponsor for the SeeClickFix tab online. Potential advertisers can be any community-minded bank or other business, a local landscaping company, a muffler or tire shop, or even a community organization. We can try to sell to an umbrella sponsor or go town by town. 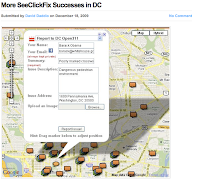 The City Fix DC's blogger David Daddio has spent the past few months "testing" the power of SeeClickFix and has found it more than useful for his city, particularly, his neighborhood, Adams Morgan. He notes in his post, three different instances where non-emergency issues were fixed through the help of SeeClickFix and local city officials. Additionally, Daddio shows that the varying issues were fixed and subsequently closed with the help of multiple active city members working together including Advisory Neighborhood Commissioners, DDOT Council Members and Parks Department leaders. It's a beautiful thing when SeeClickFix brings the community together and an even more beautiful thing when evidence of its effectiveness shows up on the streets of some one's neighborhood. Two hot issues on SeeClickFix have yielded interesting results this week. The First an issue of lighting and Public Safety. The Second an issue of saving a piece of history at the Train Station. 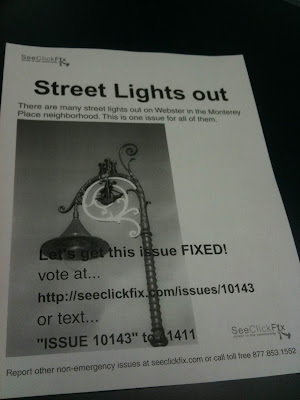 Wooster Square Residents who have been rallying for better lighting at the Entrance to their neighborhood were rewarded for their collaborative push to get their voices heard by City Hall on SeeClickFix. The New Haven Independent reports today that the Mayor, Lt Sweeney and CAO Robert Smuts met with residents to announce that they will be installing the first solar lights at the location where the lack of lighting is causing unrest. 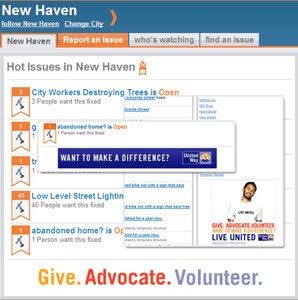 Citizens getting their voices heard in the New Haven Independent and on SeeClickFix has become an important part of an emerging form of community in New Haven where a more direct line to City Hall and each other is creating a stronger democracy. Residents of the New Haven region are also using SeeClickFix and the publicity from the New Haven Independent to negotiate the preservation of a Solari sign at Union Station with the State of CT DOT. 100's of Citizens have voted to save the sign which the DOT has recently said they will be removing for a digital sign. In response to all the clatter the New Haven Independent announced that State DOT Rep Kevin Nursick has proposed keeping the sign in train station as a decorative reminder of the analog days while replacing its functionality with the Digital Sign. While this might not be the fix for all residents its a great sign (no pun intended) that citizens are able to press a negotiation with a State Agency that is often complained of as unresponsive and far distant from citizen concerns. Whoever said that media was losing its grip as the 4th estate needs to look no further than Hyper Local Capital New Haven for another opinion. 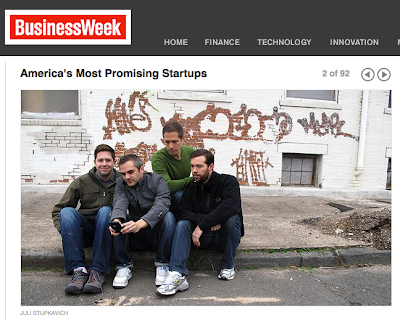 We're excited to announce that SeeClickFix has been named One of America's most Promising Start-Ups by Business Week. People have said that we look like a boy band...we would like to be called the Bad Street Boys if it has to go that way. Get It? The future of the local social web lies at the confluence of two emerging realities: Government 2.0 and Media 2.0. Here we see social networking tools, user-centered design, wikis, blogs, and mashups being used to create novel networks and platforms that enable a new civic reality: Community 2.0. Potholes, Crosswalk Needed, No Lighting, Bike Rack Needed, Rough Rail Crossing, Standing Water, Abandoned Vehicles and Broken Park Drinking Fountains were all reported as needing to be fixed in Louisville Kentucky over the past few weeks. The City's MetroCall 311 center has responded to all of these issues reported to them through SeeClickFix with work-order numbers generated from their existing service request system. Don't wait for open government, create it! Last night I was live on air with Adriel Hampton, GovLoop Founder Steve Ressler, Steve Lundsford and Andrew Greenhill from the City of Tucson. Another day, another mugging in a city. However, now citizens have a tool they can use to self-organize, crowdsource solutions to the problem, reach out to relevant public officials, create neighborhood watches, and inform the police. Last night there was another in what has become a string of muggings at the corner of Olive and Court Streets in New Haven. The incident occurred around 6:00 pm and by 7:30 there was an issue opened on SeeClickFix (http://www.seeclickfix.com/issues/10256). As of this posting, 45 people have commented on the thread. As reported in a story in The New Haven Independent, poor lighting in the area is contributing to the proliferation of crime in the area (http://www.newhavenindependent.org/archives/2009/11/ashley_kremzer.php). The problem was first acknowledged in SeeClickFix a month ago (http://www.seeclickfix.com/issues/9603.html) and over 133 citizens have joined the conversation to voice concern over the significant public safety issue that has arisen. Surfing through the comments provides insight into the ways that SeeClickFix can be used to rally support around an issue and engage with government. Several citizens have posted contact information for the New Haven Police Department and Mayor’s office. Others have suggested that citizens form neighborhood watches and attend the Mayor’s open house this evening en masse to discuss the issue. Email alerts have been sent to the Mayor’s office, the Downtown-Wooster Square Management Team, the Downtown-Wooster Square Policing District, and the New Haven Police Department. I emailed Mike Piscitelli this afternoon and soon got a return call. He was very supportive and assured me that a number of departments are aware and working on the situation. He also said that a few suspects have just been caught. I hope that everyone will show up at the neighborhood meeting on the 16th. In the meantime, I hope the NHPD will station a patrol car or unmarked during the evening hours to curtail this dangerous criminal activity. After an email alert was sent to Alderman Smart’s office, he has jumped into the conversation, acknowledging that the muggings pose a serious public safety issue and that resolution is top on his list of priorities. The Alderman has already contacted the City Engineer to advocate for increased lighting in the neighborhood that will help mitigate the problem in the long-run. 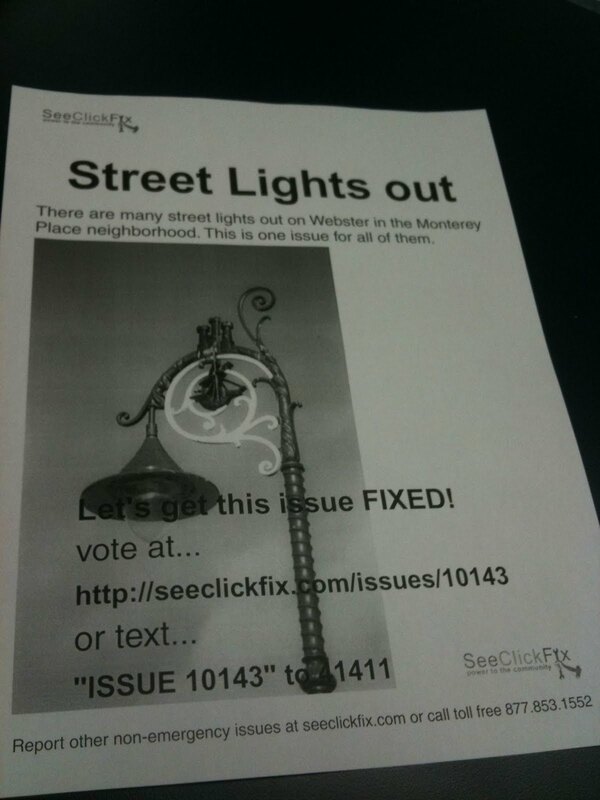 The Wooster Square Block Watch has been intensely involved in advocating for lighting in the area, using SeeClickFix as a tool for rallying support. According to The New Haven Independent, their voices are being heard—the group has a meeting with Traffic Chief Mike Piscitelli and other city officials scheduled for Dec. 16th. It is amazing to see the positive feedback loop that is being created by the interaction between SeeClickFix and local media outlets in New Haven. Issues are being uploaded on SeeClickFix, The New Haven Independent and The New Haven Register are then jumping onto the thread to source stories, the stories are being used as rallying cries on SeeClickFix to gather support to have the problem fixed, and the increased citizen participation is being conveyed to government officials via email. With coverage on the major news sites, citizens then become more aware of the fact that they have a platform for voicing their concerns to local government officials—and that the officials are actually listening. As Plato said, “the city is what it is because our citizens are what they are.” When the citizens are vocal, action will follow. Pretty powerful stuff. If Government is going to go open, crowd-sourced and platform (or Gov20 as SeeClickFix sees it) then shouldn't the 4th branch of government do the same? 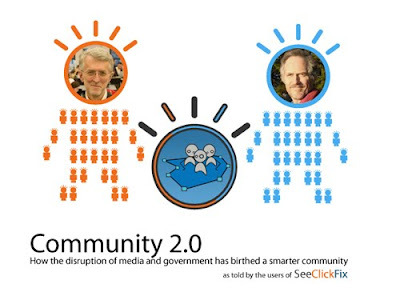 SeeClickFix is one way for the media to play in the Gov20 space and strengthen their original charge as the 4th branch of gov. 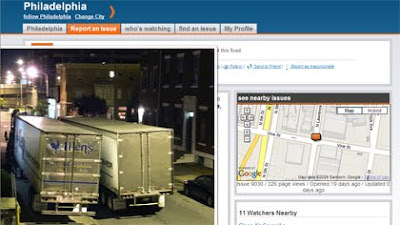 Our Partner Doug Hardy, at the Journal Inquirer, has been using a SeeClickFix Pro account to acknowledge and track issues in the Hartford, CT region. Not only does the Journal Inquirer embed the SeeClickFix map, but Doug also follows up on issues himself and makes sure that they are being listened to by officials. The Journal Inquirer introduced SeeClickFix to much of the Hartford region adding a layer of accountability to local gov that previously did not exist. Doug now uses the citizen reports to scoop stories on issues like traffic safety and other community concerns. This kind of accountability has more back-up than a pen and a delivery route though. Doug's new posse is a crowd of users that can speak and vote publicly on the issues he is reporting. 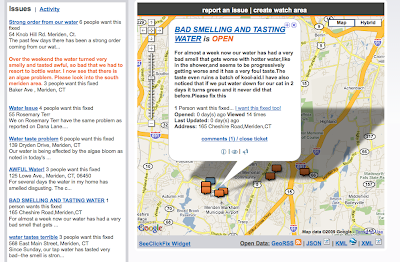 Doug can not only report on the issue but he can display the raw data of citizen voices on SeeClickFix. In East Hartford, CT it appears that this new form of accountability is quite effective at creating fixes. 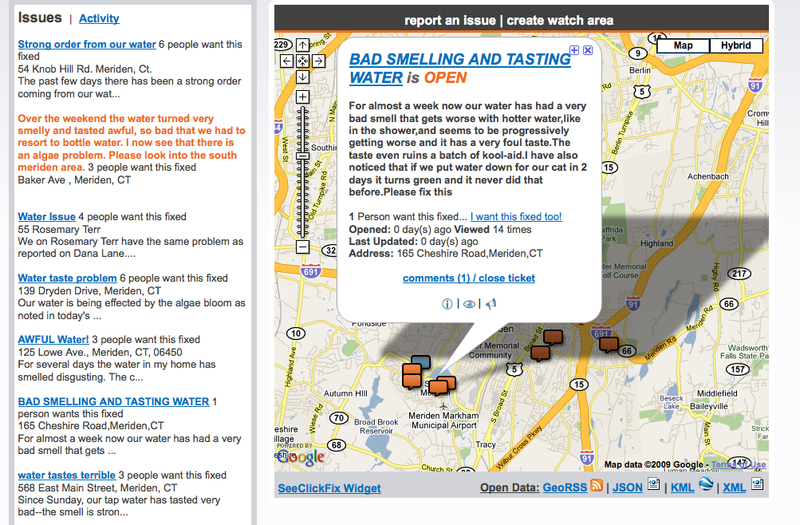 Doug was kind enough to let me post his article on East Hartford and SeeClickFix below. Some good things have been happening as a result of your reports on the SeeClickFix portion of the Journal Inquirer’s Web site. Three issues have been solved recently in East Hartford, where Mayor Melody A. Currey and public works personnel have taken an active approach and decided to monitor SeeClickFix for your reports. This is a good thing for everyone, as you’ll see below. “EH Citizen” reported that there has been a deer crossing sign covered in graffiti for more than five years on Oak Street near Farnham Drive. “It’s an eyesore and you can’t even see the photo on the sign in an area where deer often cross to access Porter Brook. Is this fixable?” EH Citizen wrote, adding that the town had been notified years ago but the sign had yet to be scrubbed clean or replaced. You can thank East Hartford for being on the ball. We didn’t need to ask on your behalf. Meanwhile, across town at Main Street and Silver Lane, the pedestrian crossing signal was reported to be too fast, leaving slow-moving folks at risk. After suggesting that the state Department of Transportation be contacted directly, within about a month ROC reported that the signal time had been lengthened appropriately. Kudos for your effort, ROC. So no progress there. Town records list three names on the property card, but I was told all three were renters. Then we got some help from Jon Searles, an East Hartford resident whose brainflation.wordpress.com blog describes him as both a concerned citizen and chairman of the 6th District Committee of the East Hartford Republican Town Committee. He also is a Town Council candidate in the municipal election. Based on that, it didn’t look like CL&P was going to take action. But about two weeks ago -- and after more than 20 comments and e-mails between residents, town officials, and myself -- Hobbs reported that the tree had been cut back and the lines were no longer threatened. Somone had taken it upon themselves to chop off the top of the dead tree. Whoever you are, thanks for helping to improve the community. Doug Hardy is an associate editor of the Journal Inquirer. 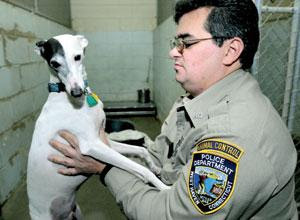 He can be reached at dhardy (at)journalinquirer.com or 860-646-0500, ext. 305. 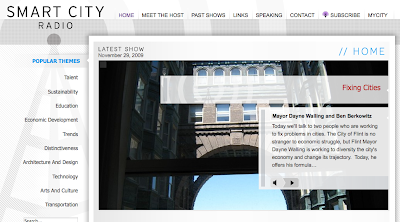 Our partners at the City Fix have been doing a great job at helping to create watch areas for elected officials in DC. They find the emails and let the elected officials know how SeeClickFix can better help connect them. When issues are reported by citizens elected neighborhood leaders can support them and give them more information. We have created some easy-to-use tools but it takes groups like the City Fix getting their hands dirty to get people to use them. We think they're doing a great job and are excited to see what the citizens think in DC. While Captain Jack Patrols the streets those with less time have SeeClickFix. A tool for everyone else. Every neighborhood has them. The guys and gals that are willing to walk the street at night and keep an eye on things. The people that have the the time to show up to community meetings. For all of those people who care about their neighborhood but don't have the time to get beyond their computer screen...SeeClickFix. This Week Dawn Richards is starting to get the Pompano Beach Association started on SeeClickFix. The first issue reported in her neighborhood as already received a response from Florida DOT. It’s pretty interesting. I’ve set up a “Watch Area” for the East Pompano Civic Association here. I’d love for you to take a quick look and let me know your thoughts. This way, while Captain Jack and his intrepid band of crimefighters patrol our streets, those of us with young children (and other pressing obligations J) can now remain fixed in front of our screens, but instead of wasting hours on Facebook we can be making a difference – without moving a muscle except to enter text! New COMPACT SeeClickFix Text Widget - Cute enough to fit on your homepage. Still strong enough to fix a pothole! The text widget condenses down to 200px wide so it fits nicely on a homepage in a sidebar. Don't worry, despite its small size this little guy is still tremendously efficient at getting things fixed and generating and displaying interesting local community concerns. The text widget also works well with its big sister the map widget and can be linked to that page already embedded in your site. Now when users report issues on SeeClickFix in an area or in your widget they can be displayed easily on the front page of your news site. Users can vote right from the text widget with their email to support the issue or report an issue right from the text widget. If you want an ad-free text widget please contact us: team@seeclickfix.com about our rev. share agreement. On the same day that floods of Vehicle Idling Complaints started coming into SeeClickFix Philly 311 started acknowledging issues using SeeClickFix Pro. A non-profit, Clean Air Council and a City Government acting on the same platform to help fix up the public space. - Philly 311 was one of the first Governments to respond quickly to SeeClickFix issues and as a result lent credibility to the tool in Philly. - That credibility helps to encourage organizations like the Clean Air Council to get its base to get involved in reporting and speaking up for Clean Air in Philadelphia. - As a result Philly 311 does not need to receive the alerts on idling (their watch area filter has -idling which excludes alerts on idling) because the Clean Air Council is collecting and Quantifying that data instead. Aside from the Clean Air council sending notices of the public documentations to private companies who's drivers are at fault they will be preparing a report of "hot spots" to be addressed by inspectors. 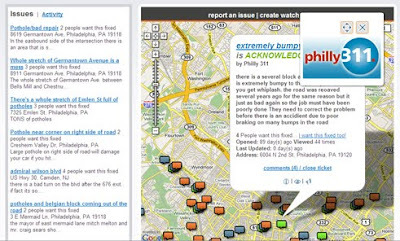 -The media has not fallen short in their responsibility either and Philly.Com displays a map of these issues helping to expose not only the potholes they originally asked readers to post but also the idling vehicle complaints and other community concerns helping to expose them to the a greater whole. While there are many SeeClickFix communities that are thriving with much less government involvement, Philadelphia 311 proves that engaging citizens in Governance can lead to a better community. I should also mention that it takes much more than a website to connect communities in the real world and a lot of the good things that are happening in Philly are do in part to people like Rob Stuart (SeeClickFix Sideclick extordinaire) who has been connecting people and letting them know about the new tool. Recent events have placed SeeClickFix and Good in similar locations and we hope to have more interactions with this excellent publication. "Are you concerned about the Digital Divide?" This question is asked every time a new piece of socially enabling technology enters the hands of tech savvy early adapters. The question becomes even more likely when the technology stands to replace existing systems. As people start to see SeeClickFix as a viable, powerful and healthy alternative for communicating with our leaders we get asked this question more and more. We anticipated this question early on and responded by providing a phone number: 877.853.1552. Here's an update: Hardly anyone calls the phone number but we still see reporting across diverse economic communities via the web. This is my gut un-researched answer as to why this might be happening: Our country has been plagued with a participatory divide long before we were plagued with a digital divide and SeeClickFix might have unlocked some potential solutions to the original problem with a simple principle: If you make it easier to engage and give a reason to engage more people will engage. The Internet provides more places to connect not less and SeeClickFix gives a reason to engage: you can get something that is bothering you fixed. The question of the digital divide is one of access. It is presumed that there was previous accessibility that will be removed from certain communities once technology is introduced. When it comes to engaging with our leaders, technology can create greater accessibility no matter where you live in the US. The Internet is readily available in schools, libraries and in many homes where you would not expect it. I would guess that the majority of people can more easily get to the Internet than City Hall or the community Meeting down the block. What many Americans do not have is time. Multiple Jobs and Children make it so most do not have time to make it to city hall or community meetings so decisions are left to the few that do. This does not just include poor families struggling to get by but women or men who can not get away from their children or the careers they are trying to keep. Some are excluded simply because of their age because its presumed that public forums and voting are not for children. When you expose a tool like SeeClickFix to a community through existing universal channels it makes sense that you would see engagement where it was previously not seen. Even if Internet use in that area is not prolific, you are engaging more people because you are doing it on their own time. Bring City Hall and the Community meetings to the people on their time and the people will attend. Community leaders should not be afraid to use computers as a policy for engaging and connecting citizens because a fraction might not have access. We may not be reaching the whole pie but we're getting a much bigger slice. And the more neighbors we can reach the more unreachable neighbors we can reach through them. Not every community member needs to have access to represent the needs of a community. All you need it one child with access to a computer and they can voice a family's concerns. So now to answer the harder question: If access is granted, will you participate? We believe that the answer is yes but we have to capture that participation and the energy of participation where its most likely to occur. People show up to community meetings when the topic effects them personally and likely when they are upset. We chose to build SeeClickFix in this spirit because we believe that the average person is most engaged when they want something fixed or improved. Yes we are encouraging people to complain because we believe that complaining can lead to bigger things. There is energy in complaining and if there is energy then there can be positive energy even if its starts negatively. When people complain they are speaking up and when they speak up they are engaging. People vote when they want change. Why can't that emotion be captured everyday at the report of a pothole or bigger requests to improve a community? A few people have told us that they have seen the SeeClickFix iPhone app crash. I just started experiencing this as well when I upgraded to apple os 3.1. It appears that this OS is creating many problems for apple as documented on their site. I just upgraded to the new os 3.2 and am not experiencing difficulty. Please do the same and let us know if the problem has been solved. The past few months I have traveled to five conferences that are all helping to blend citizen and government responsibility. The First conference was PDF in NYC put on by Andrew Rasiej and Micah Sifrey. Earlier in the month it was Grand Rapids for VeloCity put on by Carol Coletta and DC for Gov20 put on by O'Reilly and Co. This week was split between NYC and DC for the Open Cities Conference, put on by Next American City, and Walk21, put on by NYCDOT. The conferences were a mix of a meta conversations on how citizens might be using new media to improve cities (GOV20 and Open Cities) and grassroots conversations filled with groups that are using these new tools (veloCITY and Walk21) to improve cities. As keepers of a global tool for very local communities all events were valuable places for SeeClickFix to participate. All conferences were evenly filled with Government Officials (many from the Obama Camp as well as local gov. ), Media, Community Groups, non-profits and Private Businesses all looking to improve the public space and the way we interact with government. What I've taken from all of these events is that like any good unification there are allies on both sides of the line looking to engage. And, as Bill Schrier City of Seatle - CIO, said at Open Cities "You have to find your allies." The way that the Obama camp finds its allies is by attending events like this and making sure to end their speeches with statements like "you need to tell us how to improve" or simply, "please help us!" leaving the crowd with an understanding that communication and assistance goes both ways and the doors are open. For groups like SeeClickFix its easy to find allies at conferences like this but finding them is only a first step. Finding out why they are our allies is what proves most valuable and the reason why we are there. 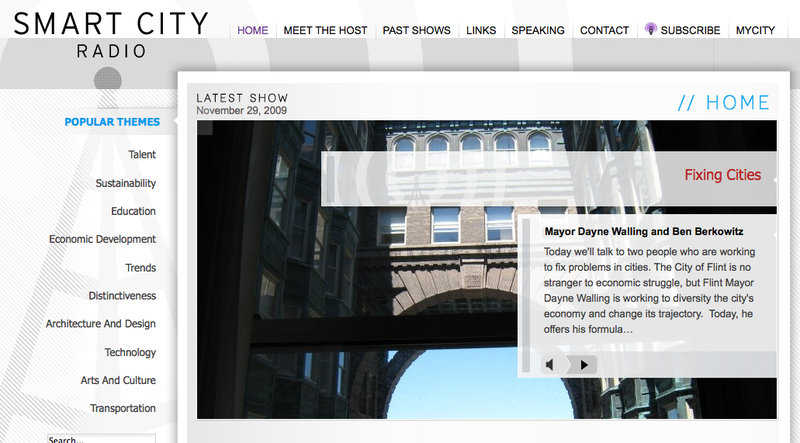 Here's a good example: When we first started pitching government on SCF we talked accountability and transparency. From events like these we've learned that accountability and transparency are stronger points for Citizens. For our allies in government cost savings and aligning with engaged citizens are better speaking points. -How can you get a citizen to be involved in the process and possibly reduce overhead? -How do you get a citizen to be more involved in their government so they better understand the burden? -How do you get broader groups of citizens more communicative so that governments can make more educated decisions? -How do we engage citizens from all walks of life when there is currently a dramatic participation gap in the US (much more real than the digital divide in personal opinion). We think that SeeClickFix answers all of these questions and can allow communities to identify their allies at the local level where change is most needed and most likely to occur. 100's of new public officials are receiving updates this week from SeeClickFix issues in their community as a result of the new website and the ease of creating watch areas from existing town boundaries. If history repeats many of the civic allies in those communities will start to show themselves on SeeClickFix will start working to improve their communities together. With SeeClickFix we are even seeing some government allies use the tool as private citizens to escape the restraints of bureaucracy and force change from the outside. Can you use tools like SeeClickFix to find allies in your community? We think so. Today we launched ads on SeeClickFix. We've always believed that SeeClickFix can provide free to nearly free solutions for communities and their governments and we expect that hyper-local ad revenue will help sustain that model. We've been busy at SeeClickFix and are pleased to announce a bunch of new features. Ben is speaking today at a conference put together by The Rockefeller Foundation and Next American City (Open Cities: New Media’s Role in Shaping Urban Policy) and we couldn't think of better timing to share the good news. He'll be talking about this stuff there, but we want to give you, our loyal users, first crack at it. The big news is that we've made it really easy to take ownership of your town. With preloaded boundaries, you can set up email alerts for your public official in seconds. In the first 24 hours 100s of new towns have been signed up. Is your town SeeClickFix'ed? Go find an email for your public official and sign them up. 25,000+ Town Boundaries. We have loaded over 25,000 cities and towns into our database so that SeeClickFix automatically knows the boundaries of Plano, TX and Philadelphia, PA. We've used US Census and other data sources for the United States. We have the framework for adding other international jurisdictions so let us know which ones you want. 8,000+ Neighborhoods. We also loaded over 8,000 neighborhoods into our database so that SeeClickFix automatically knows the boundaries. For example, Philly's Fairmont Spring Garden. We have always allowed users to create public or personal watch areas. Now we have an engine for importing these datasets. Alerts Going to 100's of Public Officials. With the help of volunteers and users, we now have email alerts going to public officials for 100's of watch areas. More are being added every day - you can do it, too. Easier to Create Watch Areas. Using the database of town and neighborhood boundaries, it's a snap to create watch areas. If you know the email address of someone responsible for your neighborhood, it takes 30 seconds to make sure they'll get alerts about issues on SeeClickFix. Go ahead. Following a Watch Area. If you're a citizen who is interested in following along with what public officials are hearing it is easier than ever. Just click follow under the name of your town and enter your email address. User Friendly. Based on feedback, we've made the site even more user friendly. Particularly for the first time user. We look forward to hearing your thoughts. Upgraded iPhone App. your town now has it's own iPhone app [iTunes]. Not only can you report issues but you can see issues nearby and vote to have them fixed. Upgraded Widgets. 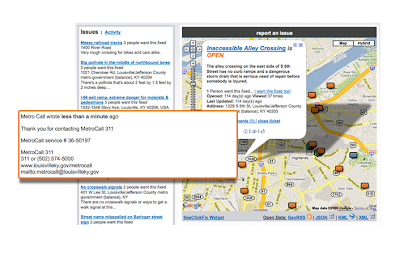 If you want SeeClickFix features embedded in your website, you can have a text-based or map-based widget. How it Works. You can read more about how it works. It could help you explain SeeClickFix to your friends and neighbors. Civic Points. And in case you missed it, we rolled out user logins with Facebook connect so you can earn civic points. We've already seen some people start racking up the points and it's been surprisingly fun to be involved in your community. Top Users. If you are using your Facebook log-in or SeeClickFix Pro Account you can set your hometown or neighborhood. 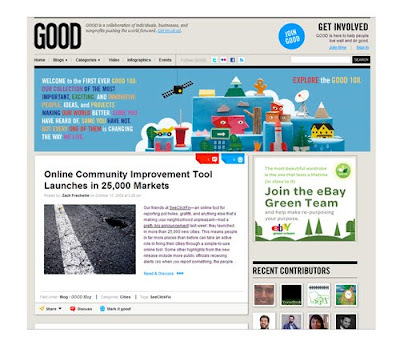 If you are doing a lot of clicking a fixing and earning civic points you'll be displayed as a top user on your neighborhood or city homepage. Reminder: SeeClickFix is a tool for communities to help themselves. Don't worry, we've got more on the way. Let us know what you want and we'll keep building it.